Butternut and buttercup squash crawl right to the top and over. 2 cattle panels side by side arched over between 2 – 4′ x 8′ boxes. Start with 2 cattle panels. Check the sizes available in your area at the local Tractor Supply, Rural King, or Menard’s. Ours are 36-38″ high x 16′ long. 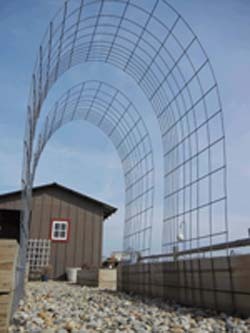 This gives enough room to walk under, yet easy to reach beans, squash, or melons when you are ready to harvest. Gurney’s ‘*Straight Eight*’ cucumber did very well last year. Stagger your planting of seeds every 2 weeks for a succession of cukes. Squash, pole bean, and melon plants will flower better and bear more if given room and sunlight. Plant as many as you want, but thin leaving 5-6″ between pole beans, 5-6″ between cucumbers, and 8-9″ between squash or melons. 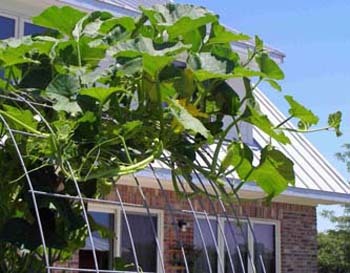 These panels can be used to grow small melons like cantaloupe or honeydew, but not watermelon. The plants will naturally develop thicker stems to hold the heavy fruit than if they lay upon the ground. It will support all but the heaviest of the squash varieties like the hubbards. Everything stays cleaner and leaves develop less fungal problems. Harvesting is usually at eye level or above, except for cucumbers which don’t grow so tall. You can sit in a chair in the shade to pick your green beans! My favorite is disease-resistant *’Kentucky Wonder*’ pole bean. You will need two people to install these safely. They are quite stiff and can poke you if it springs back when you arch it. Wear heavy gloves and thick jeans. One person on either end, walk together folding the panel. Do not push the ends together too hard, or it will bend the metal at the top and crease it. The 4′ x8′ boxes will hold it in place until you can fasten it permanently. Place the panels all the way down to the ground for stability. 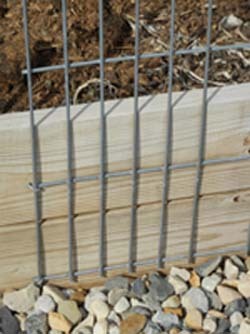 Use 3″ galvanized or exterior nails to fasten the panel to the box. Drive the nail in deeply and bend the head over the wire in several places all along the bottom. Once there are vines (especially the giant leaves of the heavy varieties of squash) crawling up and over, they can catch wind like a sail. We put ours arched so you can walk from *east to west *to take the wind well. Now, the foundation of your garden is in place. Later this summer, take time out for yourself; get a chair and rest in the shade of one of these leafy, cool arbors. Then watch the bees and hear their ‘hum’ as they work the flowers. Enjoy the fruit of your labor! To see pictures of the harvest go here.